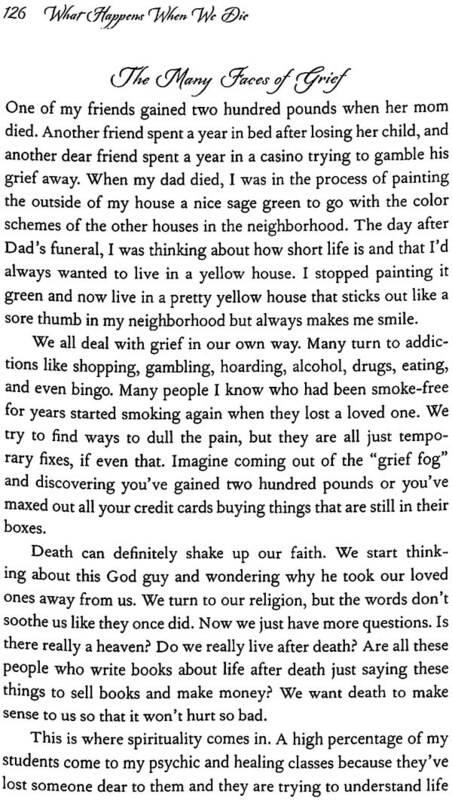 Echo Bodine offers answers to life's biggest questions: Is there a heaven? Are there people who have been there and come back? Do we have souls? Can we communicate with deceased loved ones? 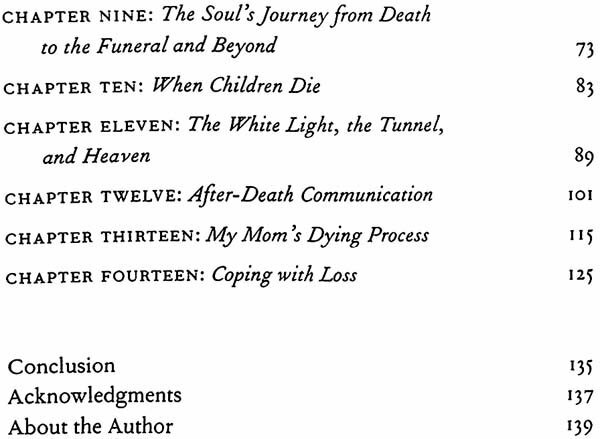 She offers practical tools for being with dying loved ones (including what not to do), for grieving (through the poignant experience of her mother's passing as Echo was writing this book), and for cultivating clear communication with the deceased. 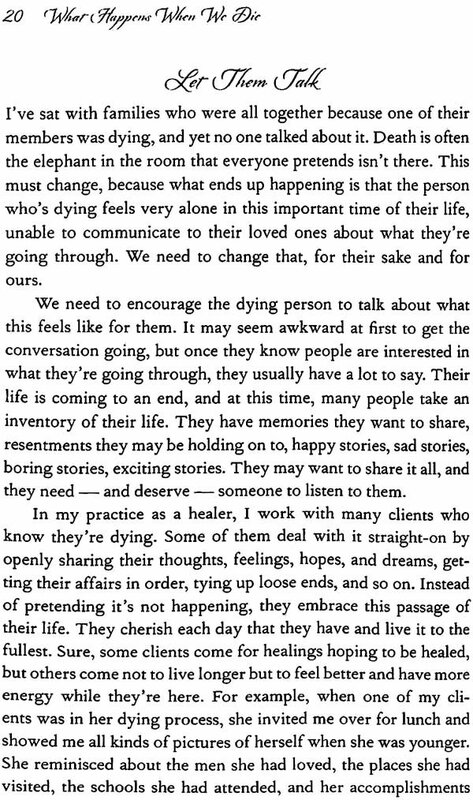 Learning what happens when we die can be reassuring and life-changing. 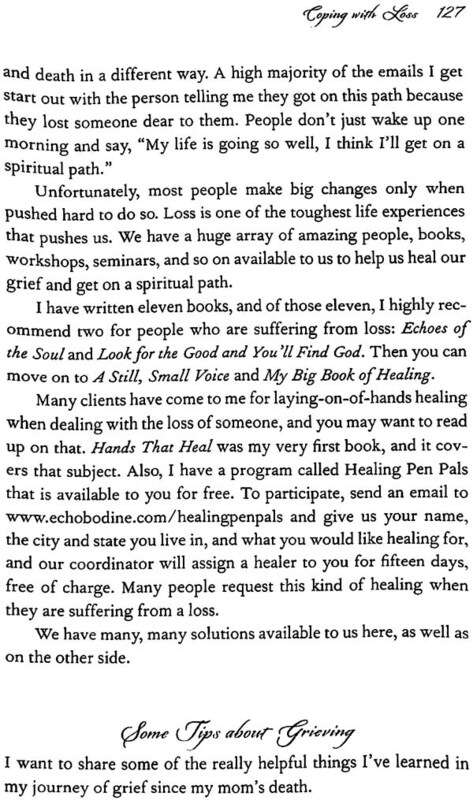 About The Author,p> Echo Bodine is a renowned spiritual healer, psychic, and teacher. Her previous books include The Gift, Echoes of the Soul, and A Still, Small voice. She lectures widely on intuition, spiritual healing, and life after death; and has a popular blog. When I was growing up, I was taught that when people die, if they are good they go to a place called heaven, and if they are bad they go to a place called hell, where everyone burns. Heaven was up, where Jesus and God live, and hell was down, where the devil lives. Fortunately, in my work as a psychic, spiritual healer, and ghostbuster, my knowledge of heaven and my beliefs about life after death, and death itself, have expanded quite a bit. I'm ever so grateful to all the dying people I've worked with and all the deceased folks I've communicated with over the past forty-seven years. One of the problems that come with having a more expanded view of death is that I sometimes forget that not everyone sees death as a blessing or as the next step in our existence. For example, a good friend of mine recently called to tell me that he has brain cancer and is going to do chemotherapy and radiation to try to get rid of this very aggressive tumor. Three years ago, this man lost his bride after five short years of marriage. Since her passing, my friend has not been the same happy-go-lucky guy he always was. He has suffered a lot of depression and in many ways has been dead himself. After I hung up from our conversation I started thinking what a great opportunity this was for him to pass on and go be with his wife. I called him back and made the suggestion that maybe he should forget about doing the aggressive chemo and radiation — perhaps he should simply live out his time here as best he can and then go home to heaven and be with her. My suggestion was met with silence. On the other hand, in the months leading up to her recent death, my eighty-three-year- old mother, who also had psychic abilities, had no problem talking openly about her dying. She knew that it was coming soon and said she woke every morning "wondering what side of the veil" she was on. 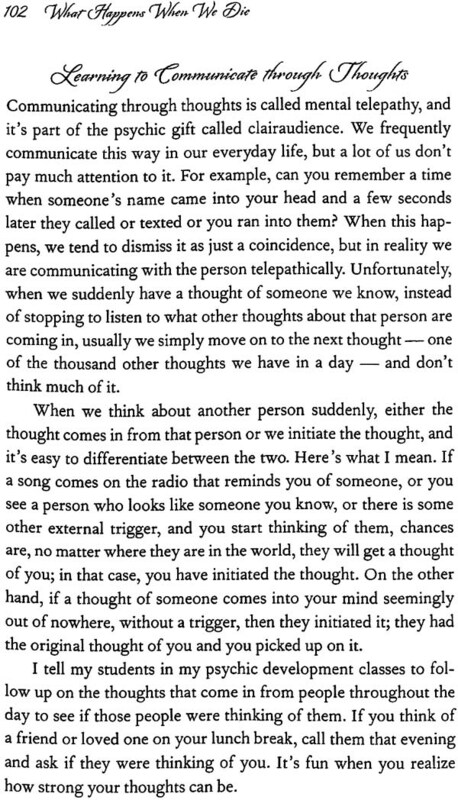 As I said, the voices of the deceased have influenced my understanding. For example, a student of mine told me about being at home one evening and having a vision of her daughter. In the vision, the young woman told her mother she was "okay," and all was dark behind her. My student was confused. The vision was frightening because she had just gotten off the phone with her daughter a half hour before. Her daughter had said she was about to run out to the store to get dinner. But there she was, appearing again to her mother and reassuring her that she was "okay." As it turns out, the daughter never made it home from the store that night. Her car was found the next morning, upside down in a ravine, the young woman dead. 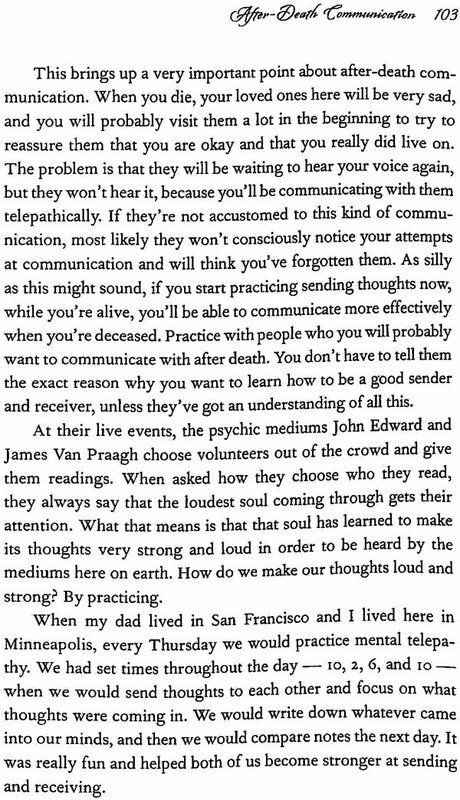 When a death occurs, I'm usually able to communicate with the person's soul within the first twenty-four hours to see how they're doing. If the soul isn't able to communicate yet, someone from the other side, such as an angel, one of their guides, or a deceased loved one, will let me know how they are. I've learned so much about the dying process and death throughout my work, and I want to share it with you in this book. When I first began writing this book two years ago, I was in the process of losing someone very dear to me, and I hated it. I didn't want his physical body to be so sick. I didn't want to see him waste away to nothing. This man had been a professional basketball player during his prime years. He had been a big man, full of vitality, and the process of his dying from cancer robbed him of all that. There was a growth on his vocal cords that turned his once deep, Barry White voice into a whisper. He had no appetite and walked with a cane so that he wouldn't fall down. 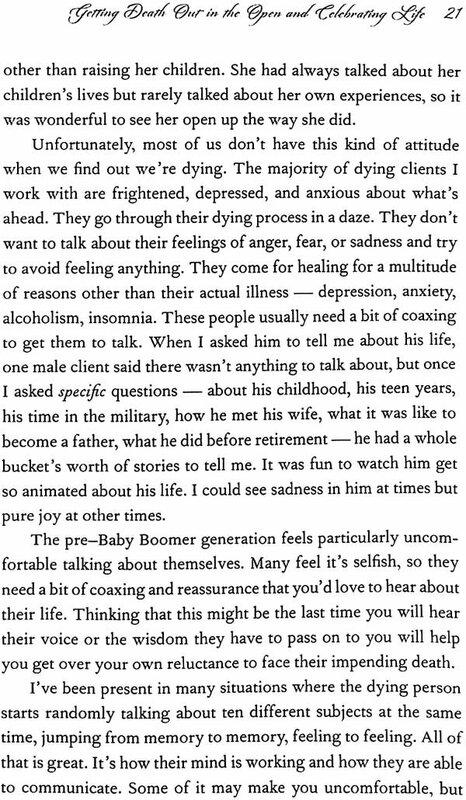 The dying process slowly shuts down our physical body, and it's something none of us wants to go through — or watch our loved ones go through. 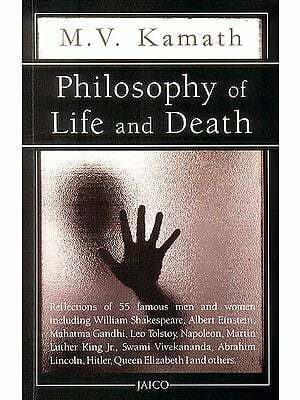 This book covers a wide range of information about death, beginning with a simple chapter about what the soul is and then a chapter about the stages that the physical body goes through in the dying process. 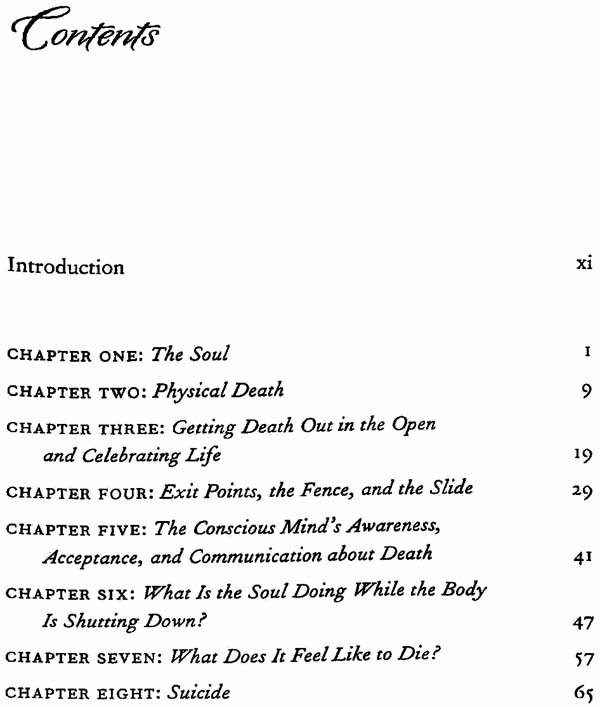 Most of the book explains death and dying from the soul's perspective, and I include lots of stories about people I know who have died and my own experiences communicating with the dead. The final chapter includes suggestions on how to move through grief or comfort someone who is grieving, whether this is due to the loss of a loved one or their own impending death. Throughout the book I refer to the Elders. These are wise counselors on the other side who have already lived their lives and now spend their time advising our souls about the choices we are making. A wonderful group of loving and accomplished souls, they help us make the wisest decisions for our souls' growth and development. Angels also help guide us. They too are wise beings, but they are different in that they have never lived here on the earth plane. Each of us also has spirit guides, souls who have been assigned to us to keep us on our path and help us accomplish the things we set out to do in this lifetime. Unlike the Elders, spirit guides may or may not be finished with their own souls' development; they aren't necessarily all-wise like the Elders and angels. You may have the same guides throughout your life, or your guides may change during your life 's major transitions. I hope this book brings you a great deal of comfort. What I have learned and experienced has not just expanded my perspective but also cemented my belief that life and death are good, and that both make for the fascinating adventure that is our existence. Everything in these pages is based on actual experiences I've had and is true to the best of my understanding.